Few things are as understated and refined as a silk knit tie. They don’t scream for attention (especially in solid colors), but they’re appreciated with further inspection. I have a few and would be happy to own more. A plethora of colors are available at "The Tie Bar," starting at $15 (go with the 2 ¾ in width). Another Tie for Christmas? Yes, Please! I haven’t seen any good tie deals pop up on ol’ eBay, lately, but here’s a good one. I especially love the blue one and the grey-green tie too. By the way, ties CAN be a great gift for the men in your life. Just try to make sure your gift complements their style and their needs. (I’m probably good for ties, though. Maybe it’s time to gift some of them). 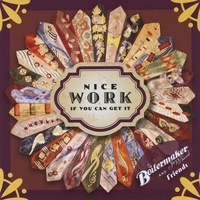 I’ve been all about bow ties for the past year (and that love will not falter), but after seeing the cover of The Boilermaker Jazz Band’s newest CD – Nice Work If You Can Get It, I was reminded of the fun of regular ol’ ties. See all those ties? That's just a small part of Paul Cosentino's (of the BMJB) tie collection. The man always looks good. eBay is THE place to find lots of ties at reasonable prices. Many printed vintage bow ties are made of rayon (synthetic silk), so they’re not often of the highest quality, so keep that in mind. With a bit of luck and vigilant searching, you can find some awesome deco ties made out of silk. Happy hunting and I’ll see you on the dance floor! Fortunately for men, it’s relatively easy to put together a versatile wardrobe. Once you own several pairs well-fitting “basics,” you can mix and match shirts, pants, jackets and accessories into numerous permutations of outfits/looks. A great, navy sportcoat or blazer (or jacket from a navy suit) is the Swiss Army knife of your wardrobe; it goes with everything. Wear it with pressed dress pants and a crisp dress shirt (tie or not) and you’re clear for dinner at a nice restaurant. It goes great with jeans on a night out in town. Basically, it will elevate most any outfit you can throw at it. Needless to say, this is an invaluable attribute when you’re short on space, packing for a weekend of dancing. hacking (angled) and/or a ticket pocket (the small pocket above the right one). This jacket would typically start at several hundreds of dollars. Why? In general, it’s made in a better way (which often means more difficult and more expensive). It’s made with high quality fabrics (Super 150’s wool). It’s probably a fully canvassed jacket (vs. fused). Plus, Purple Label is Ralph Lauren’s premier brand. (Do yourself a favor and only button the top button of a 2-button jacket, never the bottom button If you’re wearing a 3-button jacket, button either the middle or the middle and top buttons. Again, never button the bottom button). Four more of my favorite accessory: bow ties. As you may know, I’m a sucker for polka dots, so that blue one immediately grabbed my attention. The tartan bow tie is a bit out there, but it has those splashes of color that really catch my eye. Get in while the bidding is low! Good luck! The terms suspenders and braces are technically interchangeable, but I tend to use suspenders to refer to the type with alligator clip ends and braces for the type that require buttons. Clips damage pants, so I always go with the button type. Whatever you call them, they’re used to suspend your trousers at waist height. Unlike belts, braces don’t have to be cinched tightly around your waist to keep your trousers in place and in fact, allow them to drape more gracefully. Trousers worn with braces should be cut more generously in the waist (at least an inch) so the braces can be allowed to hold them up (so if you’re pants hold themselves up, they’re too tight for braces). If your trousers do not have brace buttons, it’s a simple job for a tailor: you’ll need one set of buttons in the back and two in the front, either on the inside or outside (your choice). Back in the day, you’d never see a gentleman without his jacket on, so you’d never see his braces (or know if he buttoned them on the outside or inside). Braces were a man’s inside joke, they could have the silliest, most ostentatious designs in the world, but it didn’t matter because nobody would ever see them. Things are different, nowadays; seeing a man without a jacket is common (and it’s too darn hot to keep a jacket on all night), so you better be ready to show your braces off. The finest braces in the world are made in the UK by Albert Thurston and Trafalgar. Albert Thurston (my preferred brand) has been making braces since 1820. They’ve been worn by princes, kings and businessmen for the last two centuries and have even been featured in Bond movies. Fine braces do not come cheap. Trafalgar Limited Edition braces (made of %100 hand-woven silk) cost as much as $195 for the full retail price. Albert Thurston braces hover around the $70-$80 range. The gems below come from an estate sale on eBay by micandgeo. (I was very tempted to bid on several of these for myself). For the record, I have nothing against firemen (heck, I’m friends with a fireman). I’m a firm believer that you can find just about anything on the internet, if you search diligently. The Vintage Shirt Company, based out of the UK, supplies shirts and accessories for use in period costume dramas; everything from the 1700s to the present day. A huge thanks to Lindy Shopper for pointing out this site to me. This company features a ludicrous number of stiff, detachable collars. Detachable collars? According to the common legend, the detachable collar was invented by Hannah Lord Montague in Troy, NY in 1827; she found that the only soiled part of her husband’s shirts were the collars, so she snipped off the collar, washed it, then sewed it back on. Nowadays, detachable collars are largely unnecessary as they are very formal and very tedious. If you’re looking to dress in a 1920s to 1940s style, detachable collars are a bit old-fashioned, even for you; detachable collars are more of a turn-of-the-century style. The World Wars forced more practicality into men’s clothing, so attached collar shirts became the norm. It’s interesting to see shirt designs from the 1920s onward, if only so you can notice that things have remained largely unchanged since then. The “dress shirt” as we know it, was standardized by that time. 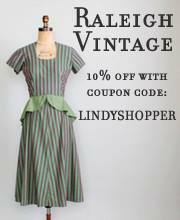 Only the fabric, patterns and proportions have oscillated with the times. just a regular dress shirt, right? This is described as a "1920’s Spearpoint collar attached shirts in White with Blue/Black stripe"
As you can see, this is a pretty simple striped dress shirt, one that you might be able to find in a dozen different places. 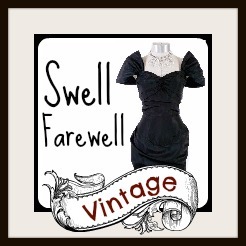 The true advantage of this store, then, is that it is a great one-stop shop for vintage inspired accessories. They’ve got a killer collection of braces (suspenders), sock garters, scarves, handkerchiefs and gloves. These are the sorts of details that can take your looks to a higher level. Keep in mind that this one-stop shop is going to be on the pricier side, especially since they’re shipping from the UK. I prefer braces with white fasteners because they match all colors of shoes (though few people are that picky about it), Henley stripe button braces, starting at £35 + VAT. These are a bit whimsical, but I like them. Reading Glass Monocles, £45 + VAT. They also carry some handsome pocket squares, £8.50 + VAT. If you're putting on some Shakespeare or plan to do some swashbuckling, this is the frilly shirt for you. Square cut frilled cotton lawn period shirt, £54 + VAT. For more on detachable collars, check out this site. Summer’s still on my mind (since I’ve missed it all while on deployment). I’m picturing this under a cool-wearing linen or seersucker suit, white shirt, no tie and a panama hat. Oh well, they’ll be ready for you for next summer. There have been some beautiful finds on eBay, lately. These ties are great, but I’m really excited about the tie clip. (as always, click the photos for the auction). These ties would be a great addition to any collection. The shapes and colors are eye catching. Starting at $22. 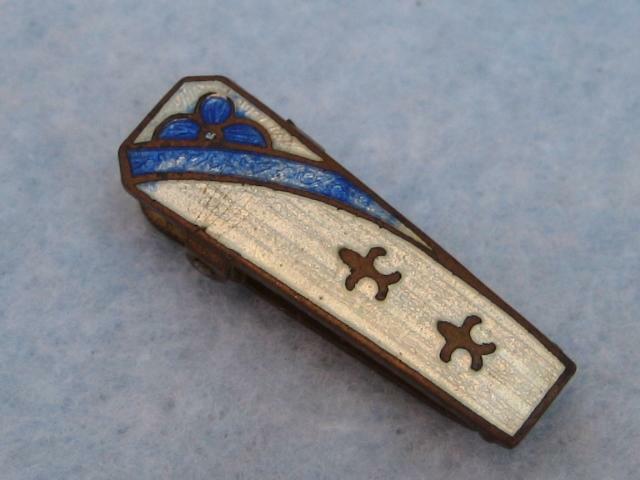 Handsome white and blue enamel tie clip, starting at $4.99. I can't think about New Orleans and Jazz without picturing a fleur de lis. (Normally, I'd buy something like this for myself, but I really wanted to share this great find). I really hope someone buys this tie clip; I think it’s the nicest one I’ve posted yet. Happy hunting! Just spotted these new Aris Allen sneakers on sale, size 8, on eBay. These are great for practice or to pair with casual attire. One of these ties popped into my saved eBay search this morning. I clicked to check out the seller’s other items and POW! These five patterned ties showed up. Busy patterns and designs can be tricky to wear. Wear it properly and you can look very sharp. Overdo it and you risk looking like a train wreck. For ties like these, your best bet is to pair their patterns with a neutral background. i.e. now is not the time to wear your favorite gingham shirt. Wear a plain, blue or white dress shirt and you’ll do just fine. (Assuming everything fits, of course). Proceed with caution; these ties would look very bad in the wrong hands. Happy hunting! It’s been a while since I’ve posted some tie clips, but here goes. As I’ve mentioned previously, it’s very easy to find tie clips in several themes. This time, we’re looking at forms of transportation. I just searched for “vintage tie clips” and found these in the first two pages of the search. It’s that easy. This post is short and sweet. I intend to do a longer post on ties in the future, but for now, I’ll just post this lot of 5 ties. These are wide ties, most of them hovering around or beyond 4 inches; ties that would look best tied a bit short with a tie bar and high-waisted trousers, a vintage-inspired look I saw several leads rocking at ILHC this year. Lot of 5 wide ties, bidding starts at $39.99. Buy now for $49.99. Even at $10/tie, that's not too bad.